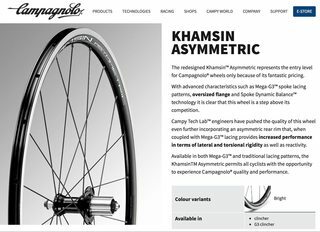 What is an asymmetric wheel and (given that we expect wheels to be symmetrical), why would one want an asymmetrical one? How is it related to dish? The "asymmetric wheel" terminology is a little misleading. This particular wheel has an asymmetric rim. Any bike with a rear derailer setup will have an asymmetric rear wheel, because the gears take up space. The usual way to handle this is that the spokes on the gear side have less of an angle (closer to vertical) than on the non-gear side. (That is, they have different dish angles) Since an angled spoke also pulls outward slightly and the horizontal forces need to balance, the gear side spokes also have higher tension. That more vertical angle and higher tension makes the gear side weaker. Combined with pedaling force tending to apply more on the gear side, the most common spoke failure is on the gear side of the rear wheel. In other words: the gear side of the rear wheel is the limiting factor in the strength/lightness balance when engineering and building a rear wheel. 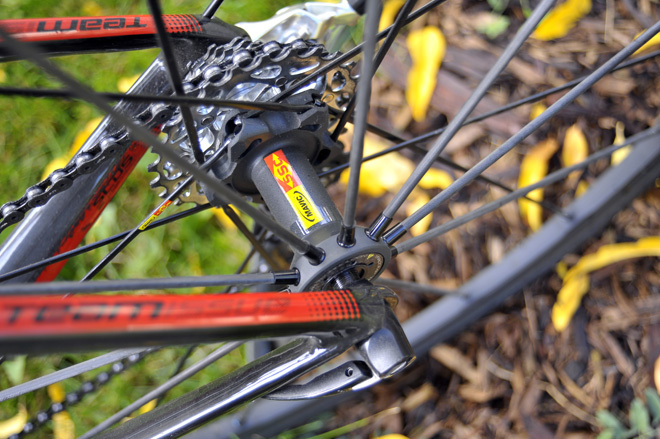 When a rear rim is asymmetric, what that usually means is that they've moved the line that the spokes all connect into away from the gears. This allows the angle to be slightly further from vertical while forcing the non-gear side a bit closer to vertical. That is, both sides will have closer to the same spoke angle. That means that the tension on both sides can be closer to matching. The wheel itself is not asymmetric, but the rim is. The reason for this is that the cassette hub itself is asymmetric, and shifting the spoke attachment at rim allows more even spoke tension. The clear benefit of even tension is durability. On one hand, peak tension and associated stresses are reduced, on the other hand loose spokes cause problems and increased minimum tension reduces those. Efficiency and reactivity are marketing speak, but surely appeal to buyers. Dish is another term for asymmetric spoke angle and tension. The asymmetric rim allows less dish for same hub and rim dimensions. Both answers are correct but I want to add a bit more. The asymmetric in the title also refers to the spoke lacing of the wheel. If you look at the photo, you'll notice that it is cross-spoked on the drive side but radially spoked on the non-drive side. So the question is, what is it good for? Probably not much. In theory a radially laced wheel can be built with shorter spokes (and thus be made lighter) but the benefits in this respect are marginal. As an owner of a Khamsin wheelset, I can confirm that it also makes the process of truing the wheel more complex. Additionally with a dished rear wheel, the spoke tension on the drive side is much higher than on the non-drive side (and presumably the nature of the load is quite different as well) so it makes sense that using dissimilar materials might give some kind of weight or stiffness benefit but the benefits are likely to be very small. In conclusion then, it's probably just another way for bike companies to sell expensive gear to people who prefer shopping to training. Not the answer you're looking for? Browse other questions tagged wheels campagnolo design or ask your own question. How do you evaluate a wheelset? Can i use a 10 speed hubbed wheel on my 7 speed/cassette bike? What variables are considered when determining wheel size and how do they affect these variables? Why not have the bearings in the forks themselves with through-axles?